In time for elections, shots fired at IDF in Arab neighborhood, rocks wound 3 on bus, soldier wounded in car attack attempt in Gush Etzion. Most Israelis may have work off as they go to vote on Tuesday, but Arab terrorism apparently didn't take the day off; shots were fired at IDF soldiers in an Arab majority neighborhood of Jerusalem, and another soldier was wounded in what seems to have been a car attack attempt. 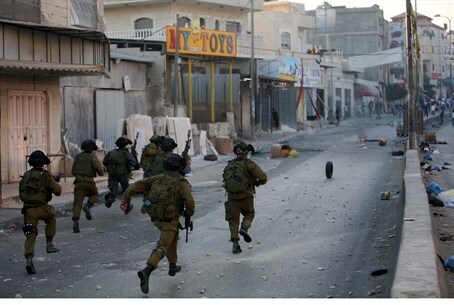 In Kalandiya, an Arab neighborhood in the north of the capital, shots were fired by unidentified assailants at IDF soldiers on two separate occasions during the course of the morning, reports Walla!. Fortunately no soldiers were wounded in the incidents, and an IDF force is scouring the area in an attempt to locate the attackers. In a separate attack not far away, three Israelis were lightly wounded by Arab rock throwers who hurled projectiles at a bus on Uzi Narkis Road adjacent to the northern Jerusalem neighborhood of Pisgat Ze'ev. The three wounded - who included among them a two-year-old infant and a six-year-old girl - were treated at the scene by medics and paramedics from the Magen David Adom (MDA) organization. Also on Tuesday an IDF soldier was lightly wounded at the Gush Etzion Junction in Judea, after an Arab driver apparently tried to run him over, reports Yedioth Aharonot. The attacking car fled the scene, but shortly thereafter a car matching the description of the one used in the attack was apprehended at Halhul Junction in Judea. The wounded soldier did not require treatment at a hospital, as he was able to escape the brunt of the potentially fatal blow. In the past the IDF has often been vague in defining Arab terrorist attacks, in what has been charged as a tactic of covering up terrorism to play down the threat and maintain the status quo. Just last November three IDF soldiers were seriously wounded by an Arab car attack in the same Gush Etzion region of Yehuda that was the scene of the Tuesday incident. One senior commander this February furiously asked why the IDF didn't admit it was a terrorist attack and not an accident, leaving the case hanging for months.